Norton Antivirus is both pricey and bloated, but the company behind it does have a very long history in virus detection and has a very comprehensive database of the latest threats. With North Security Scan, you get access to Norton Antivirus definitions for free, except that Security Scan does not come with real-time protection. Instead, this application can run a scan of your system for viruses, malware, trojans and other malicious files on a schedule or on demand. 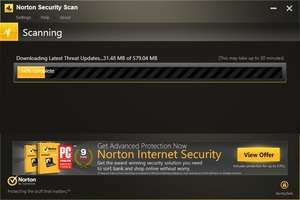 Installation of Norton Security Scan is pretty straightforward and the user interface isn't challenging at all. Version 22.17.0.183 is a freeware program which does not have restrictions and it's free so it doesn't cost anything. For security reasons, you should also check out the Norton Security Scan download at LO4D.com which includes virus and malware tests. Additional screenshots of this application download may be available, too.